When first moving into my own apartment, many, many, years ago, I found that I needed to take a door off its hinges on day one. So there I was, alone, no tools, and no real way of doing anything. Really it was a matter of being able to control my environment when it comes down to it. That very next morning, I went and picked up a huge toolkit from my local retail hardware and appliance store. When I got home I realized I wanted to put the new shower head on in the bathroom, and I was able to do it, it’s a great feeling to be able to DIY when you need to! Point is, even after I'd been there for over 3 years I remember opening this tool kit and seeing the dozens of tools I’d never touched and it was apparent that some tools fall into an "important" or “must have” category, and others, well, at least they were there in case I ever needed them. 1.) *A Drill: (my favorite)! This is the only “optional” tool on the list, as other tools can suffice for some, but I have to have my drill. It doesn't have to be the most powerful on the market, but I consider it a must have for its ubiquitous uses. 2.) Screwdrivers: At minimum a Flat head and a Phillips, but even better would be an interchangeable screwdriver that has several different sized flat-headed and Phillips types. 3.) Crescent wrenches: one large and one small. 4.) Pliers: One large and one small. 5.) Needle nose pliers: can’t tell you how often these are needed. 6.) Hammer: the mighty hammer, of course. 7.) Utility knife: very handy. 8.) Level: even a small one will suffice for most uses. 9.) Measuring tape: even up to 10 feet is fine most of the time. 10.) Saw: many uses inside and out. 12.) Staple gun: everything from cables to wires and more. That’s my list that every person living in a home or apartment of the own should have. 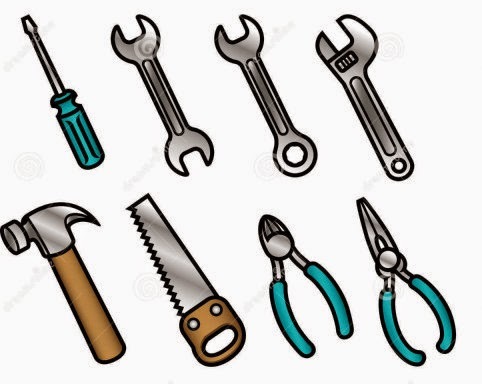 Anyone can increase the list to include every known tool available, but these will get you by in most situations, and unless you're very handy around the house you'll probably want to call a professional if there’s a big job you need to have done, and they’ll have their own tools for that anyway.